Happy International Women's Day- Thanks Eleanor Roosevelt! It’s hard to imagine a time when women could not vote or own property, or even marry whomever they chose. Thanks to women of honor, courage, and astounding conviction, our daughters can now truly be anything they choose – physicians, pilots, astronauts, or leaders of countries and corporations. Less than 100 years ago, before Michelle Obama and Hillary Clinton were even born, Eleanor Roosevelt chose to step out of her husband’s shadow and publicly wield the power of her role as First Lady to step up the pace of the women’s rights movement. While many of our First Ladies had famously exerted their influence on their husbands in the background, Eleanor broke out of the box to become a public powerhouse in her own right. On March 6, 1933, she made the bold move to hold the first press conference ever led by a First Lady. 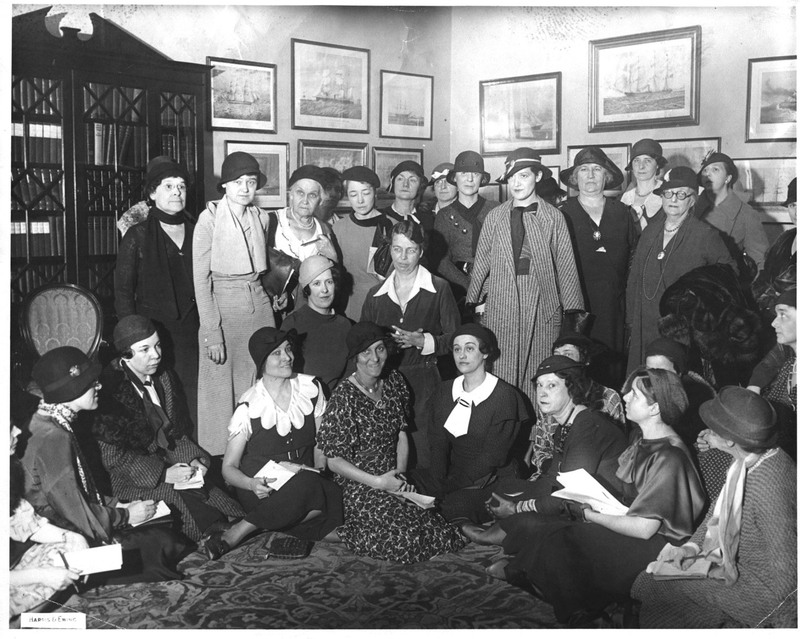 Photo of Eleanor Roosevelt, surrounded by the 35 attendees at her first Press Conference. And she invited women. Only women. Most of the major female reporters of the day attended what added up to 348 events, where Eleanor typically announced her schedule and then used the sessions to support female leaders and to publicize topics ranging from social programs, race, and youth activism, to international politics and the role of women in war and peace. Thanks, Eleanor, and all of the women who have done so much to change the face of our history. March is Women’s History Month as well. Learn more about these amazing women through the wealth of digital history shared in Today’s Documents, a service of the National Archives. This entry was posted in Articles, Digital History and tagged iwd2014. Bookmark the permalink.